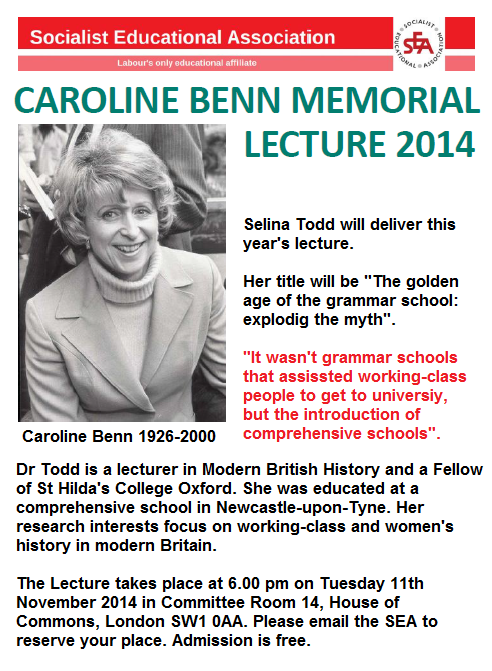 Dr Selina Todd Lectures in Modern British History at St Hilda’s. She went to a comprehensive school in Newcastle-upon-Tyne and studied at Sussex and Warwick universities. Before arriving at Oxford she held fellowships at the Universities of Cambridge and London and was a lecturer at the Universities of Manchester and Warwick. Selina’s research interests focus on working-class and women’s history in modern Britain. She is on the editorial boards of Past and Present and the Royal Historical Society’s Studies in History monograph series. She is a past winner of the Women’s History Network Book Prize and the Twentieth Century British History/Oxford University Press Essay Prize. Her latest book is entitled The People: The Rise and Fall of the Working Class 1910–2010. The myths surrounding grammar schools still have a powerful impact on educational debate and badly need to be dispelled. Selina Todd’s talk is much needed. We should let everyone who might be interested know about it to make it a packed meeting. Selina Todd’s major book has been compared in scope and significance to E P Thompson’s great work on the rise of the working class. The Guardian reviewer said “The People offers a clear, compelling, broadly persuasive narrative of a century of British history as seen through working-class eyes and from a working-class perspective. Todd avoids hectoring, but by the end one is left suitably angry: the people have been screwed”. Everyone needs to hear her!! I agree with the above comments. I was particularly taken by the phrase that the 1950’s was the era of decade of secondary modern education not the myth of grammar school education. For children in Wales who were Catholic like myself that opportunity was often not available we were confined to all age schools from 4 or 5 to 15. Having said that Wales was one of the first areas of the U.K. to implement Comprehensive education and I was fortunate to benefit from the change. To say I support Tristan Hunts position would be disingenuous because the continued existence of a private school system is wrong. Selina Todd’s lecture confirmed to me this continued segregation is at the heart of the continued inequality of British society.